Three men have been attacked by a man they met on the Grindr dating app who also tried to steal their cars. 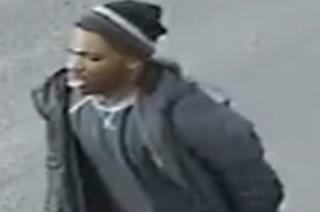 Police have released an image of a man they want to speak to over the "progressively more violent" robberies. In the latest attack, a man in his 20s was stabbed several times by his "date" in his car in Salford on Tuesday. Greater Manchester Police (GMP) urged people using dating apps to meet in public and to let friends or family know where they were going. The force has appealed to Grindr users who recognise the man to come forward. The latest victim had parked his car, with his "date" inside, in Bolton Road, Pendlebury at about 17:45 GMT when the attacker demanded he hand over his car keys. He then stabbed him a number of times before running off towards Birch Drive and High Bank Road. The victim is in a serious condition in hospital. GMP believe the same man carried out two earlier carjacking attempts on Monday. A man in his 50s was threatened at his home in Irlam o' th' Height at 19:00 by an offender with a knife who demanded he hand over his car keys, but fled the scene when the vehicle failed to start. One hour later in Prestwich, a man in his 40s had a knife held to his throat on Bury Old Road by an attacker who demanded his car keys. The victim received cuts to his throat, back and forearm and was taken to hospital for treatment, where he remains in a stable condition. Ch Insp Amanda Delamore said: "We believe that the same person is responsible for these premeditated acts of violence. "The injuries inflicted upon these men became progressively more violent with each attack and it's imperative that anyone with information on these crimes contact us immediately."